Everyone at the moment is interested in the situation in Greece – the impact of the financial crisis, why it ever happened and the future of the country. One way to understand it is to talk to the Greeks themselves, of course. 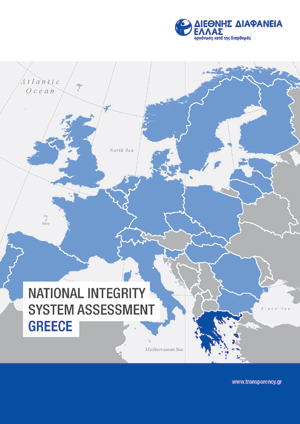 We visited Greece for the launch of their important study ‘National Integrity Systems’ and spoke not only to colleagues at TI-Greece who worked on the report, but also to key stakeholders. Their varied perspectives were invaluable and they all emphasised the importance of one of the key conclusions of the report, that is that corruption in Greece originates mainly from a crisis of values, which is linked with both the Greek mentality and the key institutions of the country. This gave me a lot to think about. This finding seems to be confirmed by public opinion polls and surveys. People recognize that there are several economic and political reasons for the crisis and they are seeking answers from their politicians. They are angry with the political establishment and disaffected by their political institutions, and unfortunately are also blaming foreigners, especially Germans. Clearly Greece is in the middle of a very difficult transition: currently, there is an appointed interim government and the election is due to be held in a month, though still to be confirmed. This exacerbates lack of trust by the public in the present government and it was quite clear to me that people do not feel that they are represented because they did not appoint the present government. The NIS report received a lot of attention, too, because one of its key conclusions is that there is a link between the financial crisis and corruption in the country. Some think that corruption cannot be a priority in the context of dire economic crisis as there are other more pressing issues. The NIS study, however, suggests a link and makes recommendations as to how fighting corruption can have a very positive impact on finding solutions to the financial crisis itself. This was picked up by the Greek media and the international media and the report was given widespread coverage. The engagement of people in Greece in these issues is fundamental – not only to help resolve the financial crisis but also in the fight against corruption. Engaging the public is one of the priorities of TI-Greece and they are working on this now, sharing information, and organizing workshops and seminars in cities and towns around the country in order to present the findings of the NIS Report and engender greater discussion and debate. Greece is facing multiple challenges and the fight of corruption is one of them. The question is whether the citizens of Greece and the political establishment alike understand that important link between the political and economic crises and corruption. When you go to Greece, it is very striking how deep the crisis is. The public anger is noticeable. On the anti corruption side there is a paradox: on the one hand top public officials say it is not a top priority for the interim government because of other more pressing priorities. On the other hand, there was huge interest in the NIS launch – it received widespread coverage in the Greek media and around the world – and people clearly see a nexus between corruption, the political and economic crisis and financial integrity. ← Public service advertising – has political corruption found a new home?